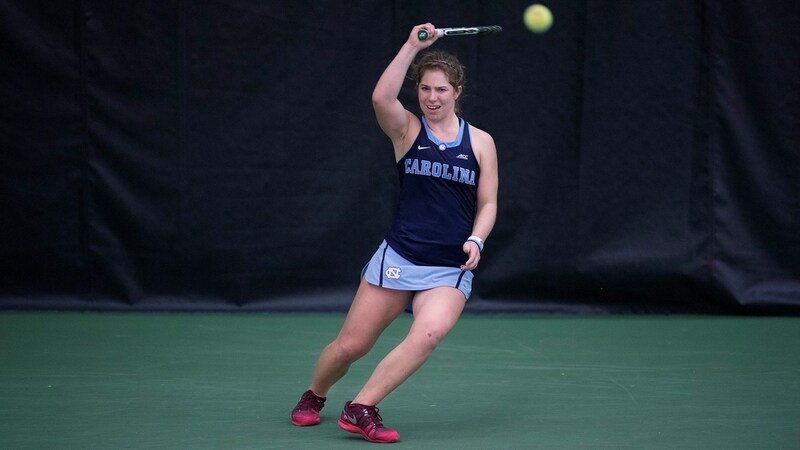 A local rivalry played out on the other side of the country on Monday, as the second-ranked UNC women’s tennis team cruised to a 4-0 shutout victory over the No. 3 Duke Blue Devils. The match was part of the semifinals of the ITA National Indoor Tournament in Seattle, an event where the Tar Heels (9-0) are the defending national champions. Senior Jessie Aney clinched the win for UNC with a come from behind three-set victory (3-6, 6-3, 6-1) over Duke’s Margaryta Bilokin. This came after the Tar Heels had to rally in order to win the doubles point at the beginning of the match, which put momentum firmly on their side. Duke’s tandem of Kaitlyn McCarthy and Ellyse Hamlin defeated UNC’s Makenna Jones and Cameron Morra 6-2, but the Tar Heels responded with a 6-2 win by Aney and Alexa Graham and a 6-4 triumph by Sara Daavettila and Alle Sanford to take the team point. In singles play, Graham cruised to a 6-1, 6-4 singles victory over Kelly Chen to make it 2-0 UNC. Not long after that, Jones won 7-6, 6-0 over Catalin Mataes to put the Tar Heels ahead 3-0. Aney’s win then locked up the UNC’s berth in Tuesday’s championship match against Georgia, which is scheduled for 1 p.m. in the Eastern time zone.